Comic Market (コミックマーケット) is the largest amateur-comic market in the world which happens in the middle of August and in the end of December. It is also famous for its Cosplay show. Tons of Manga fans from all over the world join this event and check out the hip Manga of the year. Also, many of Cosplayers from the world join with their favorite costume. Event happens for 3 days at Tokyo Big Site. Ask cosplayers before you take a photo. It is also called #Komike," the short cut of Comic Market." The Comic Market is the largest market of amateur-comic books. About 35,000 amateur Manga circles join and sale their comic book, and over half million people visit this market every year. The Comic Market is not only for Manga, but also the Sanctuary for all kinds of "Dojin," miner hobby circles. They display and sale their hand made costumes, accessories, video or PC games, mini-cars, trains, air crafts, and even pets and gardening. 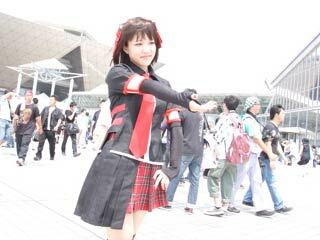 Cosplay is the most famous performance in this events. A lots of Cosplayers from all over the world join this event.